Just a suggestion since it seemed to work for us for the most part on the Dolphin forums. 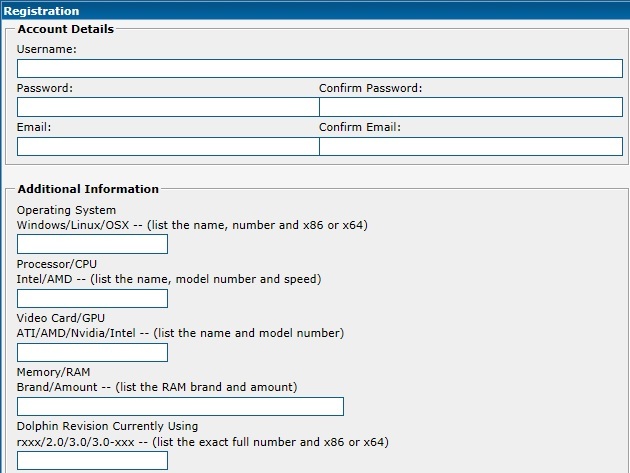 Seeing how knowing what kind of hardware people are running is so vital and so rarely ever known without asking, implementing custom forced profile fields asking for specific detailed information about your OS/CPU/GPU when new users register is a good idea. There are still times when new users will fill it out incorrectly or just type "Intel" when what we're really looking for is "Intel i5-2500k" (or whatever the case may be), but it's still better to have those lines in the registration process rather than not. Users would have to put something there or they wouldn't be able to register, so it's worth a shot in the hopes that they actually take the time to do it right. If you needed to see what kind of PC the user had, you'd simply check their profile since they were asked to provide that information at registration time. At the very least it will cut down on some of all the asking, "what are your PC specs?". How would asking new users to provide their system specs and PCSX2 revision when they register be overkill? You're just going to ask them the same thing when they create a thread. Asking them over and over again would be overkill. Asking them once when they register makes the most sense. Even if only half of the people do this, that's half of the forum with their specs permanently in their profile. Anyway, thanks for looking. (09-10-2012, 03:29 PM)Starscream Wrote: How would asking new users to provide their system specs and PCSX2 revision when they register be overkill? You're just going to ask them the same thing when they create a thread. Asking them over and over again would be overkill. Asking them once when they register makes the most sense. Even if only half of the people do this, that's half of the forum with their specs permanently in their profile. Anyway, thanks for looking. is it an idea to redirect them to a page that they can fill in their pc specs with an explanation that it would greatly help the support you will get from the forum. after succesfull being registered this page would show up and bellow there is a button that says you can skip it and be redirected to the forum page or something like that. this way they are not forced to fill it in and you dont have to fill in extra info if you dont want to. although i agree with starscream to a certain extend, if the NEEDED to fill it in then they atleast put some effort in it and if they have a stupid question (like 90% of the time because nobody seems to know what google/search mean) they would likely be quicker to google the problem then to register thus giving the members less work and can focus on the serious questions at hand. Quote: is it an idea to redirect them to a page that they can fill in their pc specs with an explanation that it would greatly help the support you will get from the forum. after succesfull being registered this page would show up and bellow there is a button that says you can skip it and be redirected to the forum page or something like that. this way they are not forced to fill it in and you dont have to fill in extra info if you dont want to. (09-10-2012, 03:29 PM)Starscream Wrote: How would asking new users to provide their system specs and PCSX2 revision when they register be overkill? What if the user registered over a year ago? The PCSX2 revision could be wrong, they could have upgraded, they could be using a different machine. Putting stuff in on the registration could only serve to lead us to providing incorrect support, it is much better to know the current situation at the time the support question is raised. People generally don't ask for support a year later, they ask for support at the time they register. 90% of the people who register come only to ask a specific question about their game and their current PC specs. Even so, a good way to respond would be to say "judging by the specs in your profile...". But yeah, obviously if you don't think it's a good idea, then it won't be added. But to me, there has to be a better way than constantly asking users to provide their specs in their thread, and that's what this thread is about.